The name Suzuki (鈴木) applies to one or several Japanese companies described below. It is not known if these companies were related to each other. 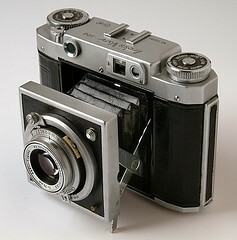 The April 1943 government inquiry on Japanese camera production attributes various lenses to a Suzuki (鈴木) company, about which no detail is provided. All these lenses have three elements. 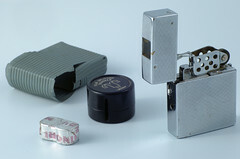 Suzuki Optical Co., Ltd. was the English name of the company that made the Echo 8 and Camera-Lite cigarette lighter cameras from 1951. It is likely that its original Japanese name was Suzuki Kōgaku (鈴木光学), which means just the same. It is not known if that company was the same as Suzuki Kōgaku Kōgyō K.K. (鈴木光学工業㈱), which manufactured the Press Van and Press Van-120 6×6cm cameras from 1953 to 1956. A number of other companies are called Suzuki (鈴木), which is a fairly common family name in Japan. For example, there is a company called Suzuki Kōgaku (Suzuki Optical), founded in 1985 and based in Hiratsuka, that currently makes various optical products (as of 2010). Records of a Suzuki Optical Co., Ltd., based in Fukui as of 2002, have been found too. ↑ "Kokusan shashinki no genjōchōsa" ("Inquiry into Japanese cameras"), lens item Jc3. ↑ "Kokusan shashinki no genjōchōsa" ("Inquiry into Japanese cameras"), lens item Lc23. ↑ "Kokusan shashinki no genjōchōsa" ("Inquiry into Japanese cameras"), lens item Lc18. ↑ "Kokusan shashinki no genjōchōsa" ("Inquiry into Japanese cameras"), lens item K8. ↑ "Kokusan shashinki no genjōchōsa" ("Inquiry into Japanese cameras"), lens item Lc17. ↑ This name appears on original boxes for the Echo 8 and Camera-Lite. ↑ Kokusan kamera no rekishi, pp.177 and 363. ↑ Official website of Suzuki Kōgaku. ↑ Entry at Zapconnect.com Medical Device Industry Portal. This page was last edited on 8 July 2015, at 02:12.